Product prices and availability are accurate as of 2019-04-18 02:20:58 EDT and are subject to change. Any price and availability information displayed on http://www.amazon.com/ at the time of purchase will apply to the purchase of this product. 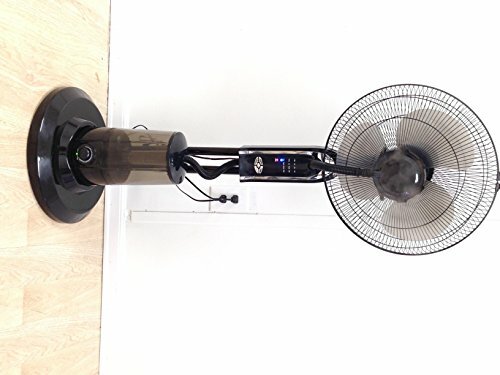 Canary Products Intelligent Misting Fan truly is a solution for all of your summer needs and because of its fine misting capability, it helps cool your home down without paying the high cost of air conditioner. Canary Products misting fan, is not only a misting fan, but it is also a humidifier, an aroma diffusers, and a mosquito repellant. CE132 also comes with a remote control that allows you to control several option with a touch of a button, while sitting comfortably on your couch or laying on your bed. Keep comfy in summer and save on energy bills with the Canary Products CE132 Intelligent Misting Fan. This clever unit adds moisture and fragrance to the air, and it also serves as a mosquito repellant. Dimensions: 1.5L x 16.9W x 51.2H in. For any kinds of customer support please send email to info@canaryproducts.com.